Notes: To make ahead, prepare recipe as directed, omitting fresh cilantro. Freeze in an airtight container up to 1 month; then, thaw in refrigerator for 12 hours. Stir in cilantro just before serving. Pulse cranberries and sugar in a food processor until coarsely chopped, about 3 or 4x, stopping to scrape down sides. Add chopped green onions, chopped jalapeño pepper, grated fresh ginger, lemon juice, and salt; pulse until chopped, about 3 or 4x. Stir in chopped fresh cilantro. Cover and chill for 2 to 24 hours. Serve with tortilla chips. Garnish with lime wedges, if desired. Notes: Try with Sage-Cranberry White Wine Vinegar. 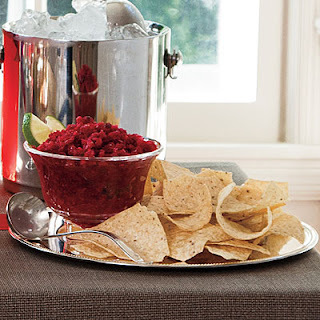 Reserve 6-oz cranberries, 1/2 clementine, and 1/2 cup of diced apple. Blend the zest and other (not the reserved) ingredients in a food processor until smooth; taste and adjust seasoning. Add the reserved fruit; pulse until they are in small bits. 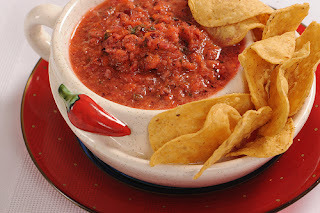 Serve salsa at room temperature with the chips.